pass the performance of the limb they have replaced . ing  now seems to being realised . and has been show to increase with higher speeds . of knee and/or the ankle. nological contribution of such technology. 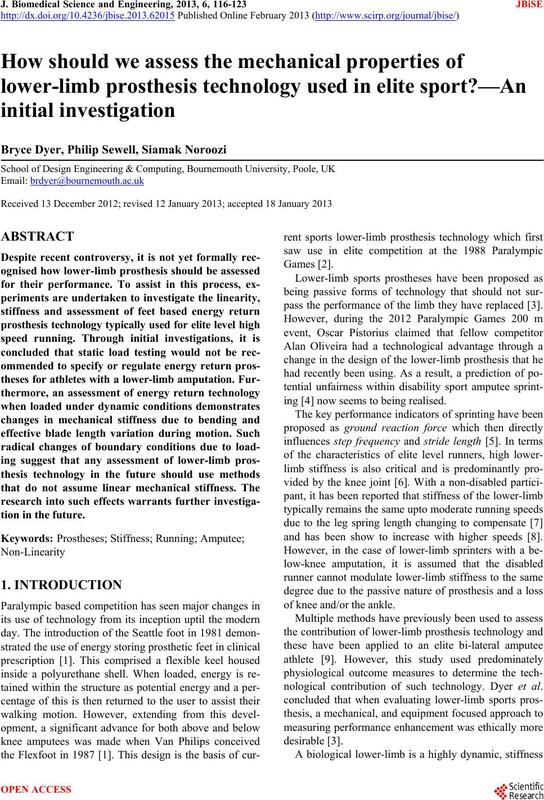 Dyer et al. sponse or assessment requires further investigation. storage and return technology. This i s shown in Figure 2. Figure 1. Elite blade prosthesis. Figure 2. Energy return footwear. 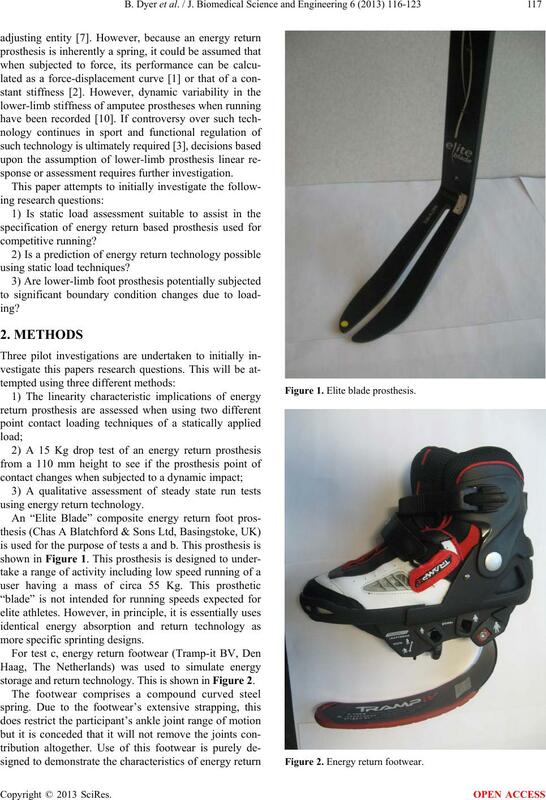 rently exists for spor ts pro s thesis technology. 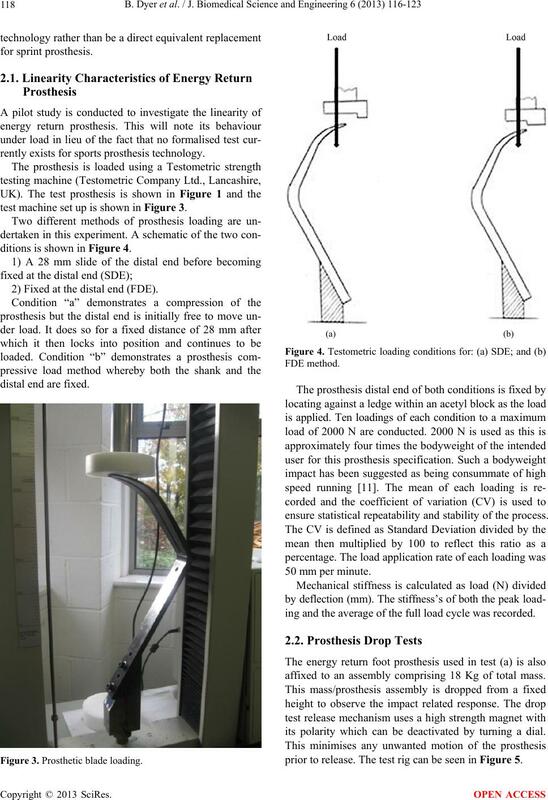 test machine set up is shown in Figure 3.
ditions is shown in Figure 4. 2) Fixed at the distal end (FDE). Figure 3. Prosthetic blade loading. ensure statistical repeatability and stability of the process. ing and the average of the full load cycle was r ecorded. affixed to an assembly comprising 18 Kg of total mass. its polarity which can be deactivated by turning a dial. prior to release. The test rig can be seen in Figure 5. Figure 5. Prosthesis drop test rig.  On the top face of the prosthesis “toes”.  At the arbitrary “ankle” position of the prosthesis.  At the straight, “shank” of the prosthesis. reflective markers as it contacts the ground. horizontal directions during the drop test. events ranging from 100 m upto the marathon distance. and gave written consent for this experiment. purposes of this study, 14 runs in total were completed. filmed at a frequency of 210 Hz. undertaken by reviewi ng the video footage. had a CV of 0.1%. The SDE method had a CV of 1.7%. light a distinctive difference in measured performance. Table 1. Loading method results. measuring the last 450 N loading sample too. 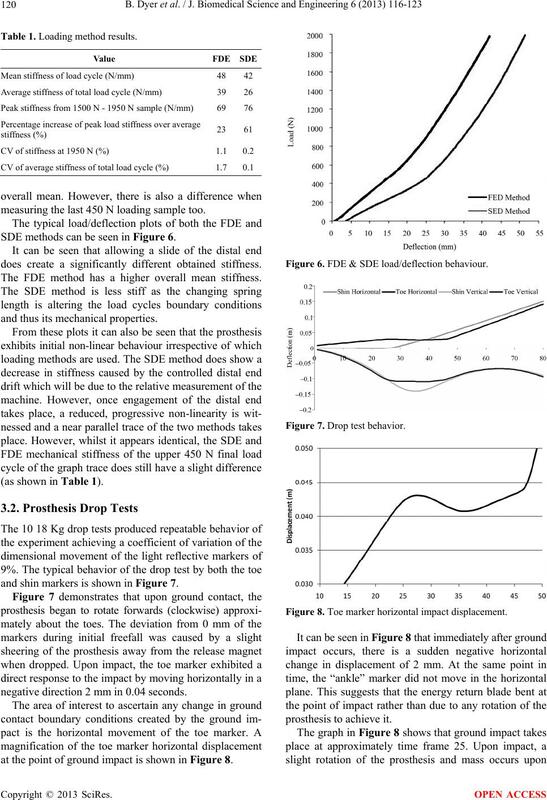 SDE methods can be seen in Figure 6.
does create a significantly different obtained stiffness. The FDE method has a higher overall mean stiffness. and thus its mechanical properties. (as shown in Table 1). 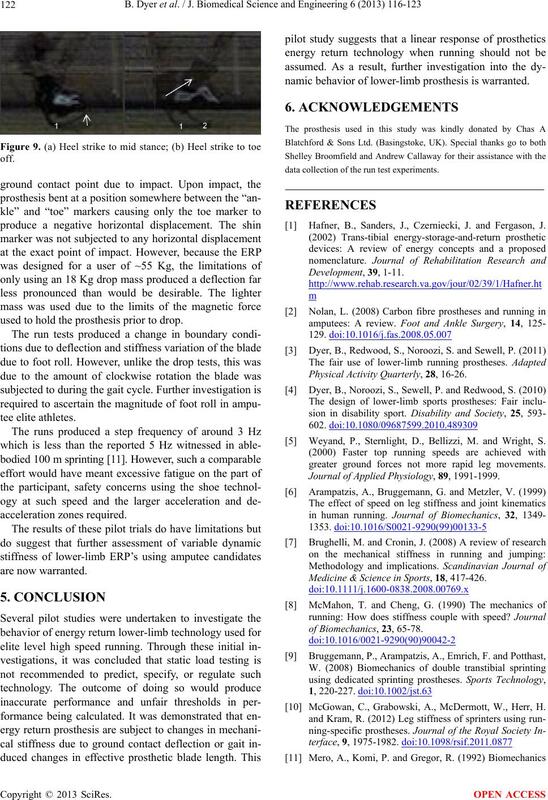 and shin markers is shown in Figure 7.
negative direction 2 mm in 0.04 seconds. 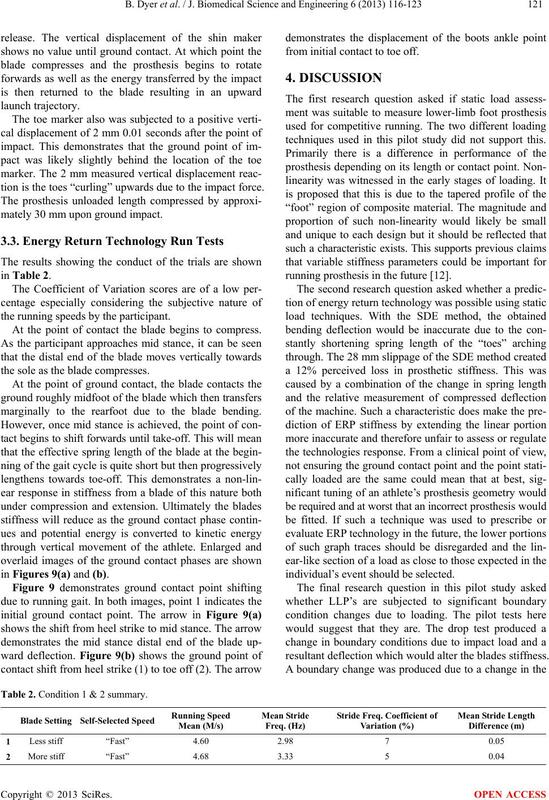 at the point of ground impact is shown in Figure 8. Figure 6. FDE & SDE load/deflection behaviour. Figure 7. Drop test behavior. Figure 8. Toe marker horizontal impact displacement. tion is the toes “curling” upwards due to the impact fo rce. mately 30 mm upon ground impact. the running speeds by the p articipant. At the point of contact the blade begins to compress. the sole as the blade compresses. marginally to the rearfoot due to the blade bending. in Figures 9(a) and (b). from initial contact to toe off. techniques used in this pilot study did not support this. running prosthesis in the future . individual’s event should be selected. resultant deflection which would alter the blades stiffness. Table 2. Condition 1 & 2 summary. used to hold the prosthesis pr ior to drop. namic behavior of lower-limb prosthesis is warranted. data collection of the run t est experiments. Hafner, B., Sanders, J., Czerniecki, J. and Fergason, J. Physical Activity Quarterly, 28, 16-26. 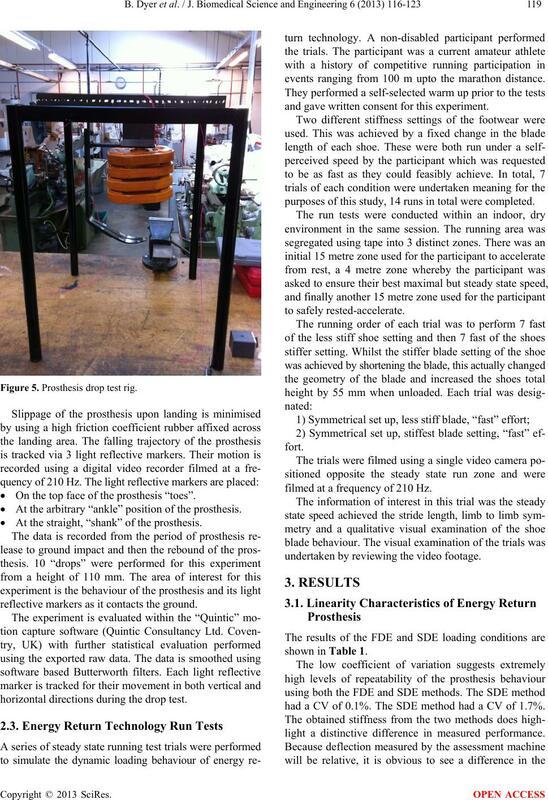 Weyand, P., Sternlight, D., Bellizzi, M. and Wright, S.
greater ground forces not more rapid leg movements. 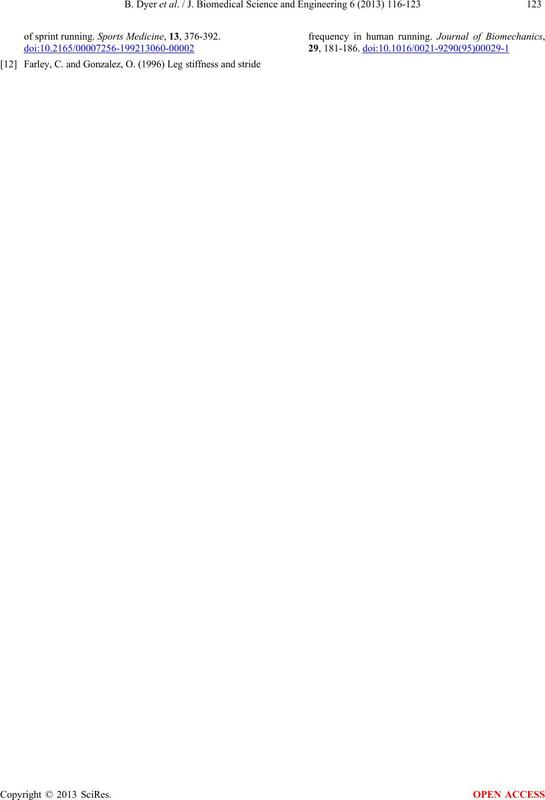 Journal of Applied Physiology, 89, 1991-1999. Medicine & Science in Sports, 18, 417-426. McGowan, C., Grabowski, A., McDermott, W., Herr, H.
of sprint running. Sports Medicine, 13, 376-392.